The main configuration file of the Joomla script contains valuable information about your website and this includes information on how your website is established in the server. It provides you with more flexibility on a server-level and allows you to perform different actions such as a backup creation/restore, configuration, change of the location for your website, etc. 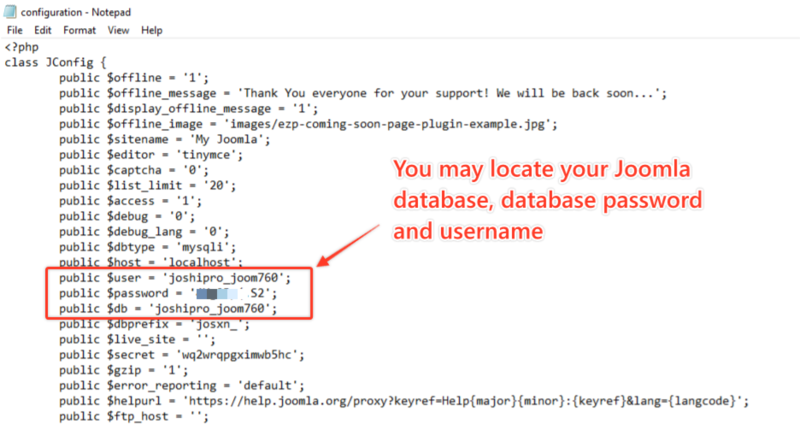 where yourjoomladomain.com is your domain name and “joomla2019” is a subfolder on your account, it means that Joomla installation is located in a folder, called “joomla2019” within the public_html/ directory of your account. When you access the configuration.php file, you will be presented with the different options available for editing. One of the most important lines of information in the main Joomla configuration file are the ones for you website database. They display the hostname of your database server (usually set to localhost), the database name, database user, password, database prefix and database type. You can even switch your Joomla site from Active to Maintenance Mode by editing this configuration.php file. Click here if you want to know how to switch your Joomla into maintenance mode. Lastly, it is important to review that information as it will be required when you intend to make a backup or restore of your database. Before you do that, it&apos;s always advisable to save a copy of configuration.php in case things did not turn out the way you want it to be.